While the original Super Flash is starting to show its age, the newer Super Flash Turbo is an impressive adaptation of its older sibling. 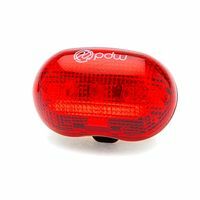 Although it looks almost identical at first sight, it doubles the power with a 1-watt primary LED, and is blindingly bright. 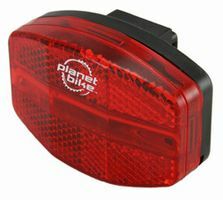 The first time I rode with the Super Flash Turbo on my bike, I was surprised to see it lighting up stop signs 4 blocks behind me. For all of the brightness measurements, I set the lights to solid (non-flashing) mode, because the light meter is not precise enough to capture brightness over the short period of time of a single flash. For each of the lights I attempted to get some data in flashing mode, and was surprised to see that for the Turbo, it shined brighter when flashing than when solid. In flashing mode I measured a max of 12,000 lux, making this one of the brightest lights available. The light also had very good side visibility. 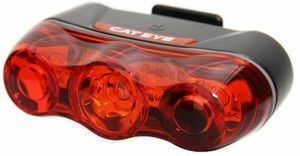 This added brightness comes at the price of battery life though – the light only lasted 24 hours before dimming, although it kept flashing weakly for nearly a week after it lost its initial luster. I’ve rarely seen Blackburn lights in the wild, but according to my poll, they’re fairly popular, so I thought I’d give one a try. 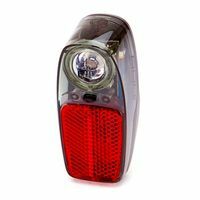 The Mars 4.0 is Blackburn’s latest taillight offering, powered by a central 1W LED, and an amber mini-LED on each side. 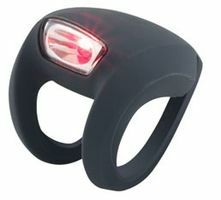 The Mars 4.0 has only two modes: solid, and blinking. The blink mode isn’t particularly exciting – just a slow on/off, but what it lacks in flashiness, it makes up for in brightness: the Mars was the 2nd brightest light (from the front position) tested. 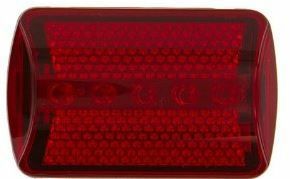 Despite having additional side-LEDs, the side visibility was not any better than similar lights – the miniature amber lights were dim and hardly visible from a distance. The Knog Frog is a bit of an outlier – it’s small, attaches to almost anything by wrapping its little rubber strap around and hooking onto itself, and it’s powered by two little CR2032 batteries, instead of normal AA or AAAs. It’s tiny, cheap, and brighter than I expected – but still puts out the least light of any of lights I tested. At $10 for the light and about $3 for a CR2032, it’s almost cheaper to buy a new one each time (batteries included) instead of replacing them. 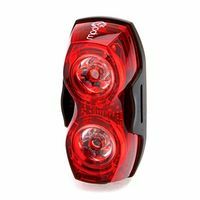 This light was dimmer than even the very cheapest flasher I could find on Amazon (reviewed below), and given its expensive non-standard batteries and low output, I don’t particularly recommend it. Unless you really need to wrap it on something which you just can’t fit a normal light on, the Frog is not the best deal, and its popularity perplexes me. Review by Nathan Hinkle, March 5, 2012, midnight . Updated Sept. 23, 2015. Note (Sept. 2015): The original Hotshot 2W is now discontinued. 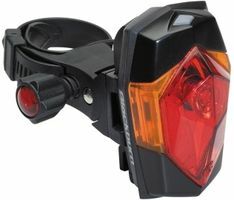 The new Hotshot 50 is nearly identical, but the flash mode outputs up to 50 lumens. In steady mode both lights output 30 lumens. This is the only light I could find with a 2W LED, and this thing is bright. Or not – you can actually adjust the brightness and flash frequency on the go, which is one of its many compelling features. 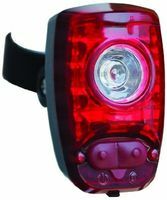 The Hotshot is powered by an internal rechargeable lithium-ion battery, which gives it an impressive runtime between charges, and has 4 different flash modes: single-flash, triple-flash, single-pulse, and an alternating bright/dim pulse. The flash frequency can be adjusted for each mode, and in solid mode the adjustment increases/decreases the brightness of the beam. The package is offered with two versions: one comes with a USB charging cable (compatible with any computer or standard USB power adapter), and the other comes with the cable and a wall charger adapter. Almost everyone has a computer with USB ports or an existing cell phone or light charger with a USB adapter though, so I recommend saving $6 and getting the version with just the cable.